Aldrich, Daniel P. Building Resilience: Social Capital in Post-Disaster Recovery. University of Chicago Press (2012). 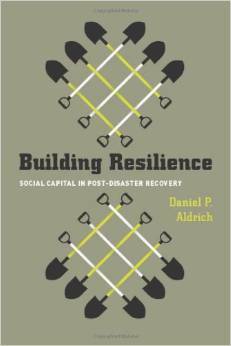 In Building Resilience, Daniel P. Aldrich, an associate professor of political science at Purdue University, argues that “high levels of social capital… serve as the core engine of [community] recovery [after a disaster]” (p. 15). Aldrich defines social capital as “the networks and resources available to people through their connections to others” (p. 2). The basic argument, that social capital is a key factor in community resilience, is not entirely new. To date, however, none has argued as forcefully that it plays such a singularly crucial role in post-disaster recovery. The argument is supported by an unusual synthesis of qualitative and quantitative research on case studies of recovery after four major disasters in the past century: the Great Kantō Earthquake (1923), the Great Hanshin-Awaji Earthquake (1995), the Indian Ocean Tsunami (2004), and Hurricane Katrina (2005). Though each case is unique, Aldrich attempts to show that, while other factors such as socioeconomic inequality may or may not have correlated with successful community recovery, no factor has correlated as strongly as social capital. Moreover, Aldrich argues, it is the only factor that has consistently mattered across cases spanning different historical time periods and geo-cultural locales. The case studies are presented in the middle four chapters of the book. The first chapter situates the overall argument within studies on disaster recovery more broadly, spanning multiple disciplines, whereas the second chapter is the conceptual heart of the book. It provides a comprehensive review of literature on “social capital,” analyzes the concept itself, tries to address the considerable challenges of its operationalization, and describes the mechanisms by which social capital influences disaster recovery and other social processes. In the conclusion, Aldrich goes further than many academics by offering an array of concrete strategies and policy choices for governments and policy makers to strengthen social capital in the communities they serve. This book is fast becoming widely cited in the disaster studies literature, as it powerfully supports a provocative and important thesis about the crucial role of social capital in disaster recovery and community resilience. Thus it is important for scholars in relevant fields. Moreover, the writing style of Building Resilienceis straightforward, economical, and easy to follow, making it accessible reading for undergraduate students as well.